Home / Clearance / Blessing, Curse or Co-incidence? The first, award-winning, film in the series examines the major covenants in Scripture in the context of their Hebraic roots, from the Abrahamic Covenant to the New Covenant. In Genesis 12:3 God says, “I will bless those who bless you, and I will curse him who curses you”. 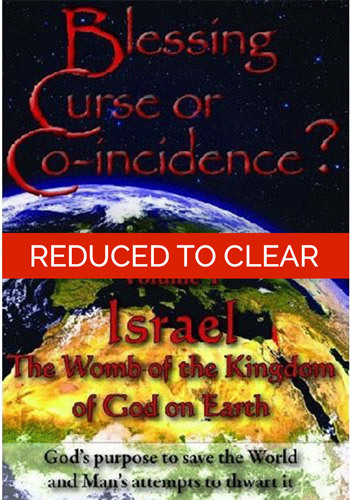 This DVD examines all that the Lord God included in this promise to His covenant people – protection, the Land of Israel as an everlasting possession, and the vehicle through whom God would fulfill His purposes for mankind. It also traces what happens to those who came against the Lord's purposes for His ancient covenant people, beginning with the Exodus from Egypt and continuing through the Biblical era to the fall of the Roman Empire. The DVD is divided into 9 distinct chapters and is accompanied by a booklet of Bible Study Notes. This DVD is available both in European (PAL) and American (NTSC) format.